Gràcia is one of the most famed and popular neighborhoods in Barcelona .It is a beautiful neighborhood that used to be an independent town until the 19th century. Today you can not find more vibrant and charming Barcelona neighborhood. The area is popular with artists and a generally bohemian crowd, it also has a high ethnic population and the highest concentration of foreign restaurants in Barcelona.Very high quality of life and environment: community life focuses on Gràcia´s plazas. Plaza de Sol is the most renowned area of the neighborhood, it is lined with terrace cafes and at night it is the place where people go out for a drink. Gràcia is totally self-sufficient. You can stay in Gràcia and never leave it. There is a lot of stuff to do there. Gràcia can hold its own with the likes of the clock tower in Plaça de la Vila, the modernist Casa Fuster, Gaudí’s Casa Vicens and stretching the boundaries a bit,Park Güell. 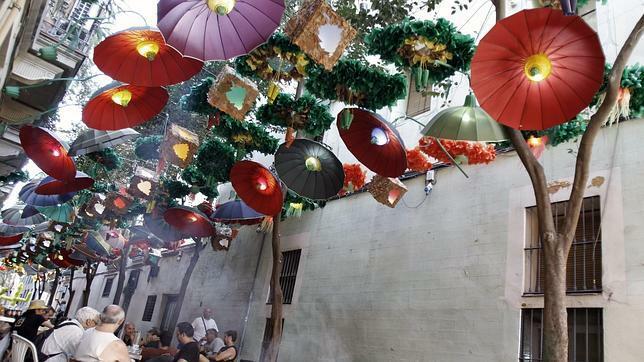 Gràcia is also well-known for one of the most famous festivals in Barcelona which is celebrated in Gràcia´s quarter in summer time, between August 15th and 20th.Definitely one of the highlights of the festival is the decoration of the neighborhood streets, each one with a different theme . The streets competing for their decorations, and the best of them are wining the annual prize organized by the neighborhood, for their originality and creativity .The results are usually spectacular, and at night the festival comes alive with drinks stalls and stages of live music of every variety. You should also walk by Passeig de Gràcia. It is one of the most beautiful streets in Barcelona, not only because of its spectacular wideness and longness, but also for the amazing beauty of the buildings standing in it.All over the street there are restaurants and cafes with terraces occupying the wide sidewalks. On Passeig de Gràcia there are luxury shops and jewelries owned by the most international designers, and the most recognized brands in the world such as Channel, Gucci , Prada,Valentino,Cartier,etc.It is the most luxurious and elegant avenue of the city. One of the best features of Gràcia is that there are not so many tourists so you feel like you’ve discovered something a bit new and diverse.It is one of the most famous Barcelona neighborhood! Gràcia has it’s very own feel and history!